The Regina Pats (12-32-1-1) are on home ice Saturday night for the back half of a home and home set with the Saskatoon Blades (27-13-6-7). Puck drop is at 7:00 p.m. at the Brandt Centre. 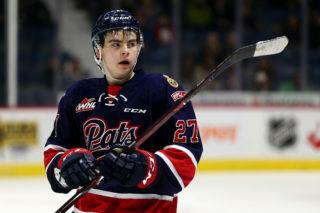 The Pats were in Saskatoon on Friday night and dropped a 6-2 decision to the Blades. Tonight is the fourth of six meetings between Regina and Saskatoon, the Pats are 1-1-1-0 so far in the season series. Tonight’s game can be heard with Bennett Dunlop Ford Pats Hockey starting at 6:35 p.m. on 620 CKRM. 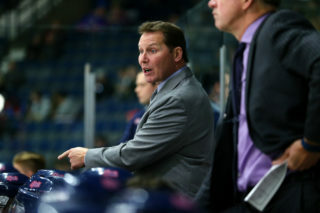 The Regina Pats dropped a 6-2 road decision to the Saskatoon Blades on Friday night. The Blades struck twice in the span of 18 seconds to take the lead nine minutes into the game. First Max Gerlach and then Ryan Hughes and it was 2-0 Saskatoon after one. The Blades extended the lead to three, four minutes into the second, Kirby Dach with the goal and it was 3-0. The Pats responded in the final six minutes of the period. Cole Dubinsky tipped home a point shot for his second of the year to get the Pats on the board. Then, with just over two minutes left in the period, Austin Pratt stole a puck in the offensive zone and scored from an almost impossible angle for his 17th and the Pats were down just 3-2 after 40 minutes. In the third, Saskatoon scored on the powerplay early to lead 4-2. They added another at the eight-minute mark and one with less than a minute left to take the two points in a 6-2 final. The Pats were outshot 34-17, the powerplay was oh for five, the penalty kill five for six and Dean McNabb made 28 saves. 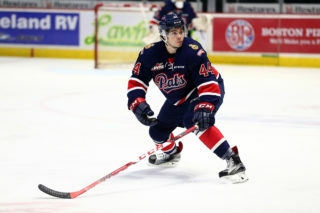 Pats forward Austin Pratt set a new career high for goals in a season on Friday, scoring his 17th of the year in Saskatoon. The 19-year-old converted on a shot from an impossible angle into the top of the net to reach the milestone. Pratt’s previous career high of 16 goals was set as a 17-year-old with the Red Deer Rebels. He has a new career high in points this season as well with 36 in 46 games. He leads the Pats in goals, assists and points. Pats forward Duncan Pierce is riding a career high point streak of four games entering Saturday night. The 18-year-old picked up an assist in the second period on Austin Pratt’s 17th goal. Pierce has put up two goals and three assists in his streak and is up to six goals and 15 points in 40 games this year. His 15 points rank fifth on the team. 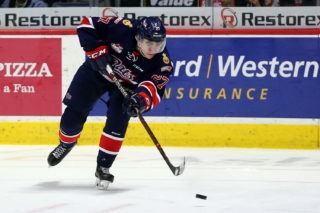 Pats forward Riley Krane is also riding a career long point streak of four games after an assist on Friday night. The product of Dawson Creek, B.C. has scored a goal and added three assists over that span. 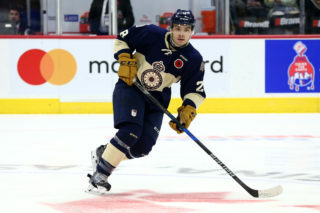 The 18-year-old has scored three goals and added five assists for eight points in his last nine games and sits second on the Pats in scoring with 18 points, nine goals and nine assists. Krane is tied for 20th among all WHL rookies with 18 points and his nine goals are tied for ninth.